The other night before our pub quiz some of us went to another local country pub for dinner. My brother recently asked me what kind of beer people drink here so I asked my mates if I could line up their drinks for a picture. The beer on the left is an Italian beer. The drink on the right is a London Pride Shandy, which is a mixture of London Pride beer and lemonade. 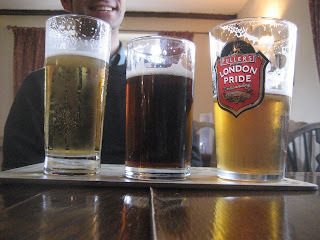 The one in the middle is called Colley’s Dog from the Tring Brewery. About the shandy, the lemonade in the shandy is not what we Americans think of as lemonade. It’s more like a lemon lime soda. This particular pub is a freehouse. The food was good. One of my dinner mates had the mixed grill which came with a beef steak, a lamb steak and a fried egg on top. That's one of my favorite pictures you've posted. hahaha!